Original alcohol inks on 74lb Yupo paper then photographed and arranged to fit a custom envelope template, laser printed on 8.5" x 11", Southworth White 24lb 100% cotton paper. Each envelope was cut from that paper using an Ellison Prestige Pro Cutter with a custom 6-3/4 envelope die and hand-assembled. Only 55 were made. The large, well-protected harbor of Portsmouth, New Hampshire, on the Piscataqua River, was an important port in colonial America. It remains New Hampshireâ€™s only deep water port. 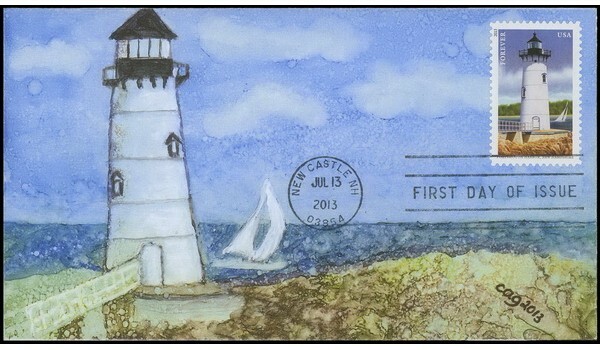 A wooden lighthouse was established at Fort William and Mary on Great Island. Construction began in April and the tower was first lighted by early July of 1771. It was the first light station established at a military installation of the British colonies of the present United States, and the first lighthouse in the American colonies north of Boston. The light was electrified in 1934 and automated in 1960. A fourth order Fresnel lens remains in use, covered by a green acrylic cylinder. The characteristic has been fixed green since 1941. 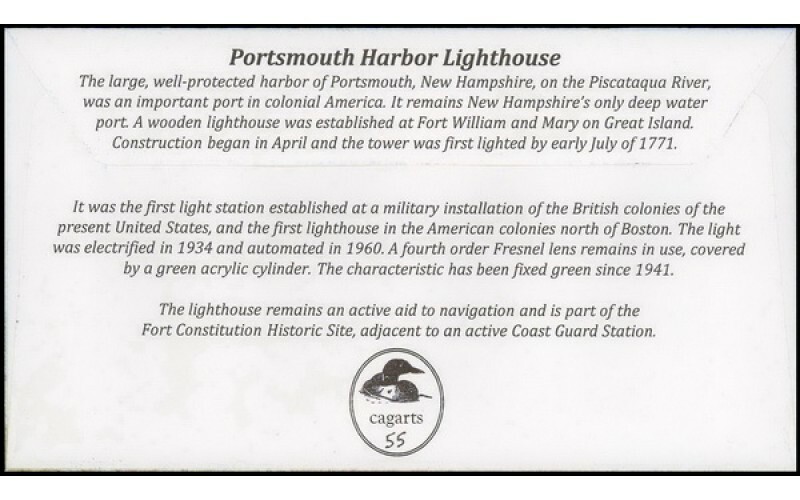 The lighthouse remains an active aid to navigation and is part of the Fort Constitution Historic Site, adjacent to an active Coast Guard Station.